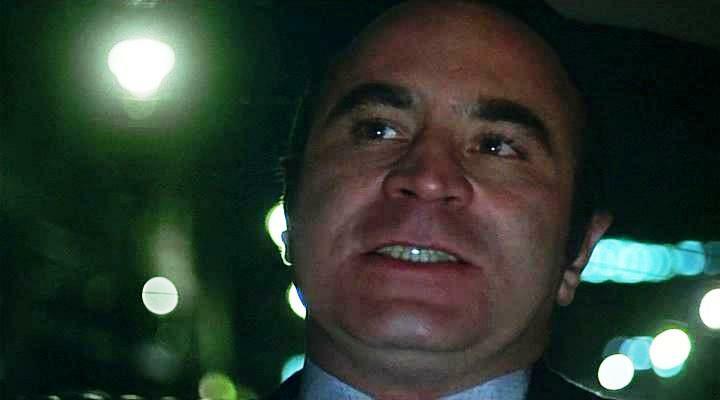 I can think of two indelible images of Bob Hoskins: one is of him sobbing inconsolably behind his novelty sunglasses when he realizes that Cathy Tyson has been using him all along in Mona Lisa, and the other is the extended close-up of him at the very end of The Long Good Friday. The latter comes at the moment Hoskins, playing a barbaric little gangster named Harold Shand, has just realized that he’s made the miscalculation of a lifetime—one that will cost him not only his life but the lives of those dearest to him—and that there’s nothing in the world he can do to fix it. The shot lasts some two to three minutes, and not a word is spoken during it because there’s nothing left to say. Harold is seated in the back of a limo that’s whisking him to his doom, and the shot’s tight framing and its location in the story make it a bookend to the closing shot of Michael Clayton, an unblinking close-up of George Clooney sitting in the back of a NYC taxicab, as he reflects on his role in events we’ve just witnessed. Now, I love Michael Clayton dearly—it’s just the kind of thriller Hollywood ought to be cranking out by the bucketload—and Clooney is great in it, but his moment simply pales next to Hoskins’. An agonizing parade of emotions—surprise, fear, regret, outrage, defiance, grief—washes over Harold’s face, and Hoskins expresses each of these in such concrete terms that you feel like you’re tracking every inch of his anguish. And in the end you can see it happen, in his eyes and his tightening jaw-line, when Harold experiences the belated, now meaningless discovery that his downfall was entirely avoidable—that he has only himself to blame for his ruin. It’s a ghastly, glorious bit of work.